Enjoy - Food & Travel: Infuse your spices! When visiting the US I always buy spices in industrial quantities. This time I bought 4 large boxes. 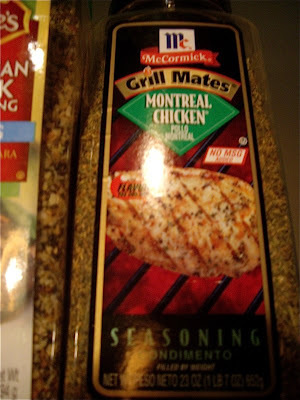 Montreal Chicken, Canadian Steak, and Italian seasoning and Emeril's Essences. The latter a creation of celebrity cook Emeril John Lagasse. When preparing chicken in Scituate September 15th, I decided to infuse the spices. Most of us just open the lid and sprinkle the seasoning directly on the meat. The result gets so much better if you infuse them. The Indians always roast their spices in a dry pan in order to bring out the tastes. I used another technique. I poured 5-6 tablespoons of Montreal Chicken seasoning into a bowl, added 10 cl (4 liquid oz) olive oil, and mixed them well. Make your own combination, but remember if there are salt in the mix, avoid soy sauce and other salt seasonings. When preparing the mix for the chicken, I also added tomato ketchup, to balance the saltness and 5-6 cloves of finely chopped garlic. Here you may use other ingredients as well as lime, teriyaki sauce, or maple syrup. In order to release more flavour, I heated the oil & spice mix in the microwave oven. 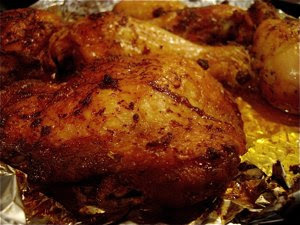 We had bought 4 lb's (2 kilos) chicken thighs and drumsticks. We placed the thighs and drumsticks into 4 ziplock bags, poured equal quantities of marinade into the bags, closed them and allowed the chicken to marinate in the refrigerator over night. It was obvious to us that the marinade was a success, when opening up the resealable bags the next morning. The spices had released all their aromas and second phase in the preparation could start. 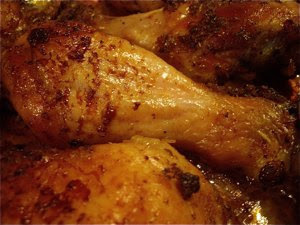 The best to prepare chicken is to bake it for a long time in an oven on a very low heat. We dressed two baking trays with tin foil, placed the thighs and drumsticks on the trays. Sprinkled the excess marinade over the chicken. placed them in a very low oven (220F) and allowed them to bake for 5 hours. At this low heat you will end up with a delicious result with no effort at all.